Daily Press, Aug 5, 2014 (emphasis added): MYSTERY ILLNESS — Alyssa Langel[‘s] three-year-old horse […] has large patches of skin exposed. [Owners] remain unsure what caused many horses to manifest swollen eyes and lips, as well as blisters […] They heard of a similar outbreak affecting other horse communities in California. Kendall Melline, owner of sick horses: “It’s devastating… I’ve got my national champion, who her entire body, her entire first layer of skin is going to fall off.” […] She’s not seen any improvement in Bunny and is very concerned. Press Enterprise, Aug 12, 2014: [Brian Cockerton’s] two horses had […] rashes and burn lesions […] lesions spread over most of the horses’ bodies [and they’re] in pain. 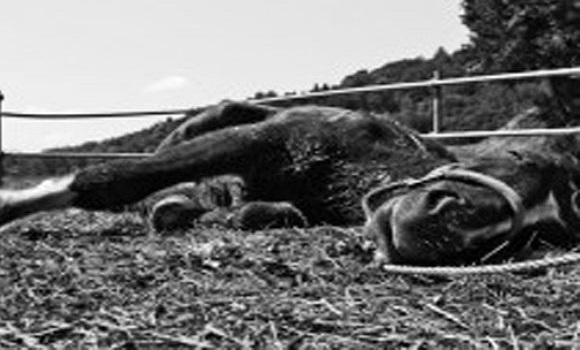 “It’s horrible […] dozens of cases [are] affecting horses in a widespread area of Southern California in at least the past 2 1/2 weeks. […] There may well be many more unreported cases, [an official] added. […] hair and skin – later began falling off in big patches [and one] fainted twice while being washed […] A farrier told Cockerton he hasn’t seen anything like it in 40 years of shoeing horses. Was a laboratory test for radiation sickness done?